Last year I saw more wingless bees than I had expected and I used more thymol than I had expected. I realized that I could partially thank the bad weather fort thias. The bees had got too little of pollen. Their immune system was not at its peak. 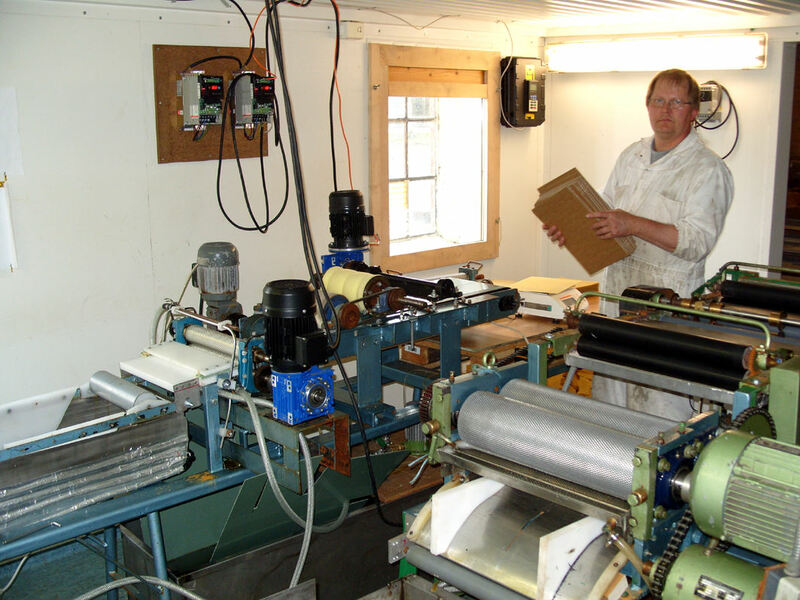 It was not easy to find suitable breeder queens, ie, who showed great varroa resistance. I found a colony that had not needed varroa treatment for a few years and it had not had any wingless bees. VSH test could not be done as I found only one mite in more than 100 pupae. And this mite had no offspring. So if you would allow it to determine the VSH-level, this would be 100% VSH. However, the so-called statistical significance was non-existent because of the low number of mites (just one single one). Well, the low number of mites were decisive. S241 was last year’s most important breeder colony. This summer, I have not seen much of mites and almost no wingless bees so far. Some odd mites in 4 colonies, of more than 140 hives. Well, those who got the most thymol last year, got Thymol in May this year and then got its Queen replaced. So that’s one explanation, about 15 colonies. A colony that was a split from one of those 15, which raised a queen of their own was the first. Due to it’s history it got Thymol as soon as I saw the wingless bee. The queen will be shifted. A problem hive had got a daughter of S241 last year. 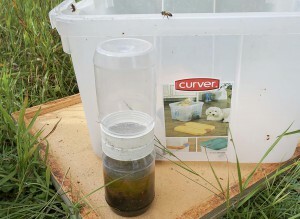 A Beeshaker test though showed 0% varroa level. Viruses still a problem in spite of no mites? The other day I saw a wingless bee on the hard board in front of the entrance of a colony that had got a lot of Thymol last year. It did not get Thymol in May as it was shifting its queen in May, I found a dead virgin on the hard board and drew that conclusion. I decided to make a test with the Bee shaker due to the wingless bee. I did it yesterday, July 20, 19 mites out of minimum 300 bees , 6.3% varroa level. The hive got Thymol. 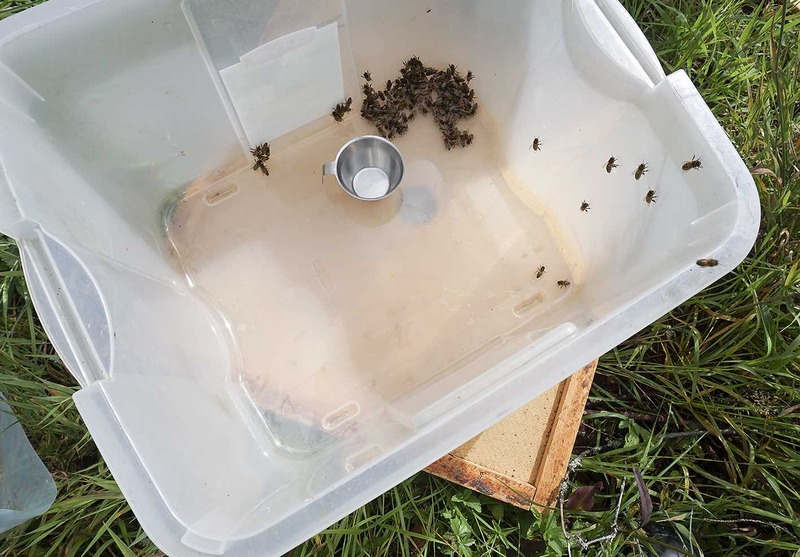 19 mites, 6.3% Varroa level – Thymol. Today I came to an apiary with a daughter of the 241 (introduced in 2015) which have had no need for Varroa treatment in a couple of years, neither 2014 nor 2015. This colony was now a strong colony that given a good crop. With still some time to go for eventual more honey to come. No need for treatment for a couple of years (2014 and 2015) plus probably this year. Actually lower Varroa level now compared with spring ( at least not bigger). In May, I tested interesting candidates for being breeders with the Bee shaker. This 241-daughter was among those of course. The Varroa level was 2%. I didn’t give it Thymol as this was not more than 3%. I had several colonies, including several 241-daughters, that got only a few grams of thymol in spring 2015, which showed no mites at all (zero) out of more than 300 bees. The two best with different heritage (one was a 241-daughter) I used as breeders this year. 4 mites, 1,3% Varroa level now. 2% -colony I tested today July 21 regarding the Varroa level, 4 mites out of a little more than 300 bees. 1.3% infestation level. At least not higher Varroa level after 2.5 months. A strong hive that has given a good crop. The Varroa level would have been much higher if the bees could not get rid of mites themselves. This colony has thus been able to get rid of mites by themselves. What a great feeling! One mite from 300 bees. I understand that sometimes it’s a good idea to get an idea of the infestation level of varroa mites in bee colonies. 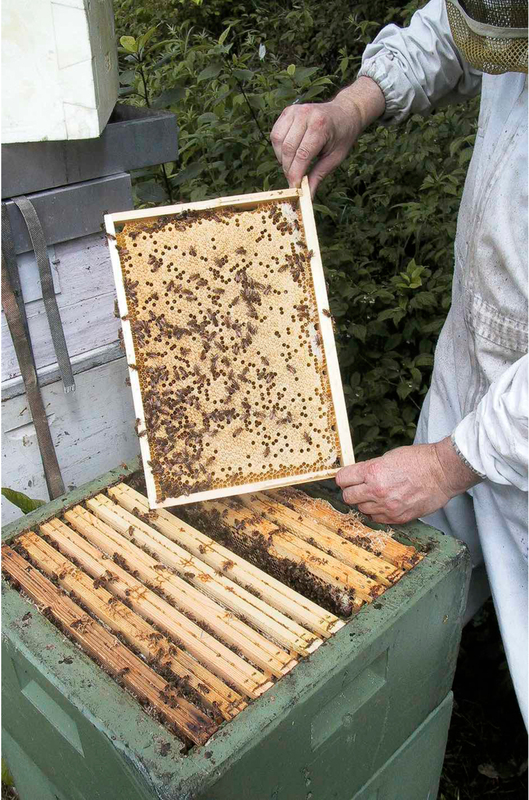 You can take samples from a couple of colonies in an apiary to get an idea when to treat. But my first concern is breeding varroa resistant bees. I have never monitored the varroa infestation level in my colonies. 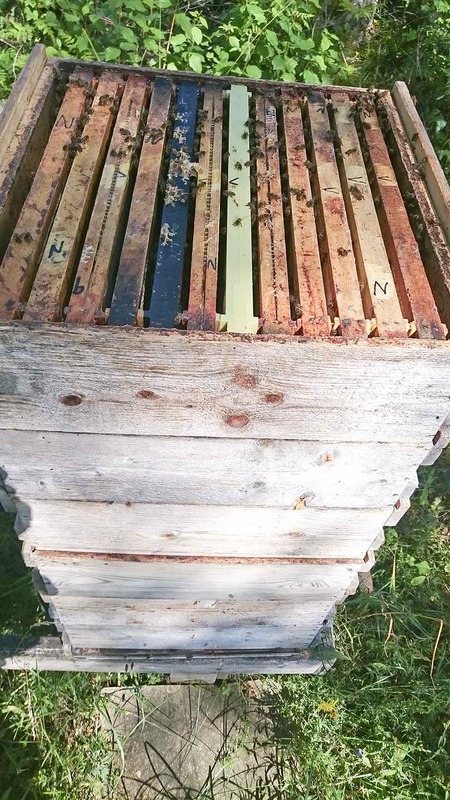 I haven’t had time and I haven’t found any reason for it because I thought I had found a good compromise – treating with Thymol when I saw wingless bees on the hardboard in front of the hive entrance, checking every 10 days or so. I give a colony one or two pieces of dish wash cloth containing 5 grams of Thymol each when I see wingless bees crawling on the hard board in front of the hive. But this means I don’t treat every colony at the same time (hopefully some not at all in a season). This results in some colonies with higher mite loads not showing wingless bees yet. So these colony (-ies) will through reinvasion increase mite levels again quite quickly in those colonies recently treated. But this way I’ve been able to develop more and more resistant bees and still produce a good crop. There have been a number of bees not producing any honey. Winter losses have been reduced from 30 % to 10-15 % (except the first year with varroa trouble when I lost 50 %). The bees have been better chasing mites and remove infested brood. I’ve got good reports from for example Poland and Germany of low populations of varroa in colonies headed by Elgon queens, compared to other bees. And the VSH trait is becoming better and better. Daughters of my colony with the highest VSH % (80) gave colonies that in Poland dropped 2-5 mites after effective treatment while other colonies dropped more than 1000. I now have been aware that by having this regime I have a constant quite high varroa population in the apiaries as a whole, and thus probably a climbing virus pressure. In a way this is good as selection is done also on virus resistance. How do I know that? 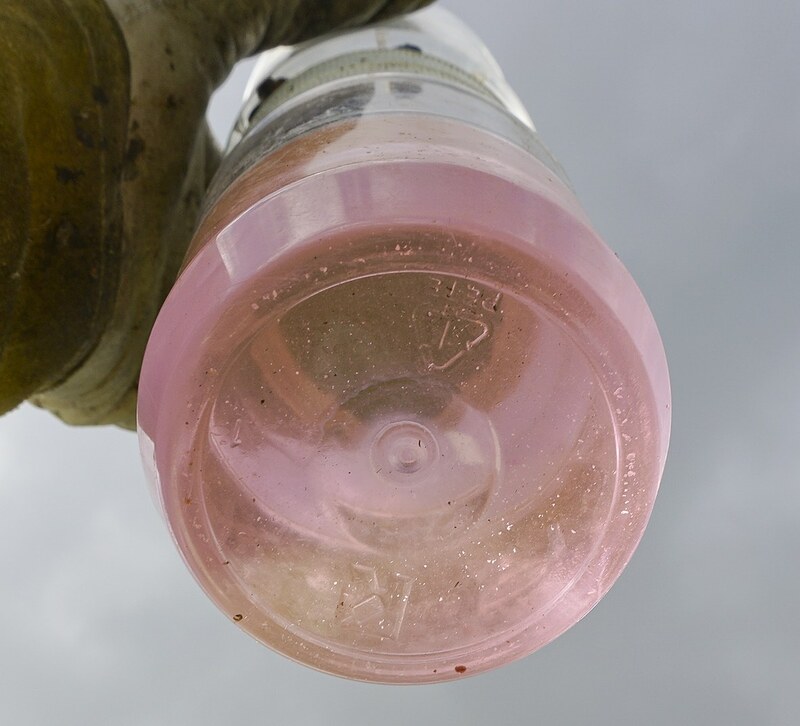 Now when I’ve used the bee shaker somewhat this year I’ve seen that colonies may show wingless bees (DWV-virus) at low mite infestation. Such low infestation you didn’t expect them to do so, sometimes even as low as 2 % infestation (a daughter from a colony with high VSH trait [80%]! This experience and others similar, raise the question if very high VSH comes with higher susceptibility to viruses.). Wingless bees at 2 % infestation is totally different from a report I’ve got from a test further down in Europe. (There they normally treat effectively every year.) In that test where they didn’t treat at all, my bees didn’t show any wingless bees at 35% infestation while other bees had a lot. Now I have to try to explain why my good bees could arrive at 35 % mite infestation. This is interesting and brings up another topic as well. The importance of memories of the worker bees (their knowledge how to chase mites), not only their genetics (and epigenetic history). My queens in this test down in Europe were introduced to bees that had not been selected the same way as mine, and those bees had been treated effectively every year. The bees could probably not chase mites as well as mine. But of course the genetics from my queens would more and more influence the workers to build up a better behavior when it comes to chasing mites. When the bees have arrived at a good mite chasing mood they learn new bees born in the colony what they have achieved, more than what just come directly with the genetics. In Norway with Terje Reinertsen and Hans-Otto Johnsen experiences are achieved pointing strongly to this. In an apiary where many colonies are non-resistant as in this European test, you get a mixture of all bees in the apiary through drifting and robbing. This is taking place more and more when the mite populations in the colonies rise. As it did in this test as the colonies were not treated at all. In a situation when colonies are receiving a lot of mites from neighboring colonies, even the very best kind of mite chasing behavior is maybe not enough to keep mite levels low. In the test apiary previous to this test, effective treating every year had kept the mite and virus levels low, so the mite population could grow much in the test without showing wingless bees – like in the beginning when the mite first arrives to an area. Then the virus levels are usually very low and there could be 10 000 mites and more in a colony without any signs of viruses (documented case in Sweden in 1987 when the mites were first detected on the island Gotland in the Baltic). The bees in this test were on 5.5 mm cell size, while my bees are kept on 4.9 mm. I have talked to some beekeepers whose bees are totally treatment free since many years (Hans-Otto Johnsen in Norway, Richard Reid in Virginia and Myron Kropf in Arkansas). Their bees have now small populations of mites and are showing no wingless bees. I have come to realize that also Thymol is a chemical that hinders the bees to fully adapt to handling the mites successfully on their own. It is in first place the epigenetic adaptation I have come to think of that is disturbed when alien chemicals (like miticides of all kinds) are present. Epigenetic changes take place when a chemical change occur due to environmental changes, like for example the presence of the mite. (But it should be said also that if you use Thymol regularly spring and late summer in a system not selecting better bees like I do, winter losses can be kept low. I know because beekeeper friends do like this.) Also Thymol like other miticides is lowering the immune system of the bees. How do I then integrate these insights to go further in becoming totally treatment free? I’m planning a new strategy, at least to start with in one quite isolated apiary. I have to stop using Thymol. First though I think I have to knock down the mites effectively to reduce the virus level. And then get a better control of the number of mites and take action without any chemicals if varroa populations are rising too much in colonies. Here the bee shaker will play a role. And I have looked more into how Randy Oliver uses it. It’s much easier to shake a frame of bees into a bowl or pan and then with a measuring cup scope somewhat more than a deciliter (3.5 oz) of bees and pour them into one half of the bee shaker, half filled with alcohol (for example methylated spirit or rubbing[isopropyl] alcohol). Then screw it together and shake for a minute before reading the result. Compared to holding the bee shaker close to a frame side with bees and pour bees into it moving it slowly upwards, the alternative of Randy Oliver is quicker (at least for me). The next step is to test the VSH trait in the best colonies. Start checking from one side in the uppermost box with brood. The queen hopefully will run to the brood if she is outside the brood area (probably not). 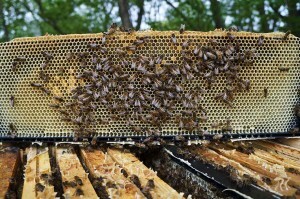 The comb closest to brood you check so the queen is not there. Pour the bees into one of the halfs of the bee shaker, which is half filled with alcohol. Screw the other half tight on top. Shake it for a minute. Turn the shaker upside down and continue shaking until all the alcohol has poured down. Lift it up against the sky and count the mites. This colony had 14 mites on 300 mites and it got two pieces with 5 gram Thymol each. It showed no wingless bees. So what I’ve done so far is something I hated to do. In one quite isolated apiary I used an effective chemical miticide (only this time I promised myself) in August 2015. I wanted to use something else than Thymol to give the bees a break from that chemical. And I wanted to knock down the mite population effectively to lower the virus pressure in the apiary. I collected the knocked down mites. (In the rest of the apiaries I plan at the moment to continue as before.) The colonies that had needed most Thymol earlier in the season had the highest downfall of mites. They got probably continuously reinfested from other colonies that happened to not show wingless bees while they anyway had quite high mite loads. 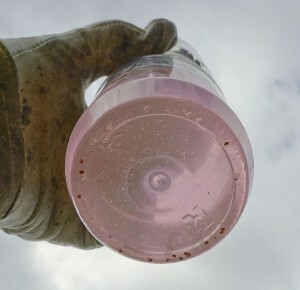 The defense system of these quickly reinfested colonies was probably lowered by Thymol, which made this relatively quick reinfestation possible. 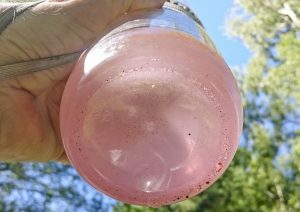 One colony that hadn’t needed any Thymol at all (and very little the year before) and still had given me 80 kg (175 lb) of honey with 20 kg (45 lb) left for winter dropped less than 200 mites. And this happened in this very bad season of 2015. This colony is of course a breeder for the coming season. Next year I will in this new strategy apiary make splits from the best colonies and place them in the same apiary (or if the number is enough there, place in other apiaries). In the least good colonies in this apiary (those with highest infestation level) I will kill the queen and give them a ripe queen cell bred from a good colony in this apiary. I check the number of varroa (infestation level) with the bee shaker twice a season in all colonies in this apiary. Each time it will take about 5 minutes per colony. And I look for eventual wingless bees on the hard board in front of the entrances. Before the number of mites rise too high (whatever that is), or when I see wingless bees, I plan to remove all capped brood (worker and drone brood) once or twice with a week in between. I haven’t decided what to do with those brood frames yet. Any suggestion? There have been numerous tests of varroa reproduction with bees on different cellsizes throughout the years, with the assumption that you then test varroa resistance. As far as I understand that can be true, but you don’t know to what degree it is true. 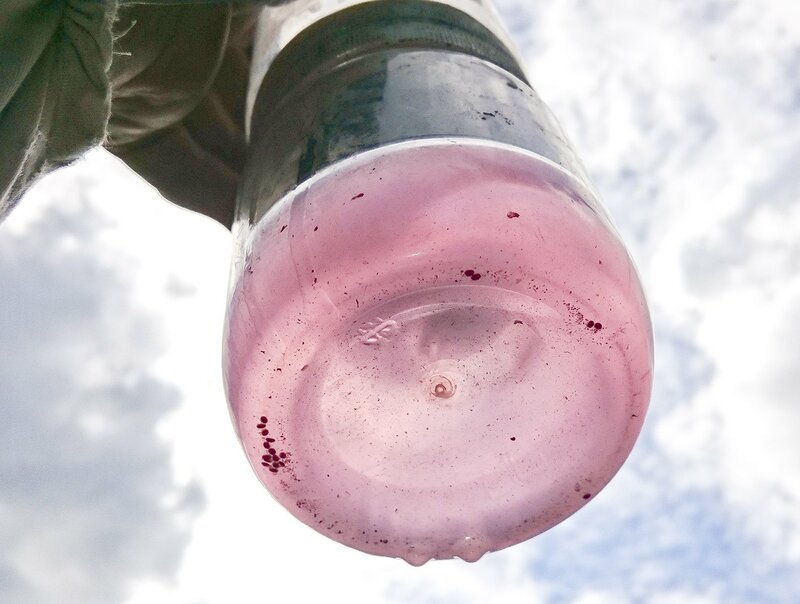 One thing is clear – testing varroa reproduction is focusing on mite behavior, not on bee behvaiour. 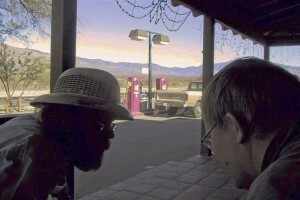 Bee behavior is for example VSH (http://www.elgon.es/diary/?p=146). VSH test in 2014. I use a reading glass with lens lamp plus a pair of reading glasses 2.5+ and tweezers. Leaving out bee behavior when trying to understand varroa resistance is not a good choice. But mite reproduction is also interesting if you want to get full understanding of Varroa resistance. For the practical beekeeper though the easiest is to focus on VSH, maybe measuring mite population once or twice a year (http://www.elgon.es/diary/?p=354) (http://www.elgon.es/diary/?p=365) and listening to nature to get the fittest kind of bees, using small cells at least in the brood nest (http://www.elgon.es/diary/?p=224) (http://www.elgon.es/diary/?p=119). What about mite reproduction in small cells? At first when mites arrive in an area, mites reproduce well enough to grow very big mite populations, also in colonies with small cells, in South America and in South Africa – and with me. But after 5-6 years the bees have developed what is recognized as mite resistance. Maybe with me too soon, this is the fifth year and I have seen very promising results. 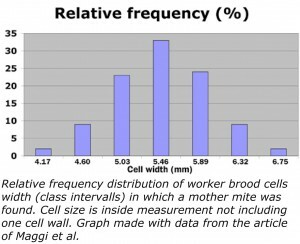 The best test on mite population growth in different cell sizes I find “Brood cell size of Apis mellifera modifies the reproductive behavior of Varroa destructor”, by Matı´as Maggi, Natalia Damiani, Sergio Ruffinengo, David De Jong, Judith Principal and Martı´n Eguaras in Exp Appl Acarol (2010) 50:269–279 (http://www.ncbi.nlm.nih.gov/pubmed/19768560). It’s a test under natural conditions, not a designed test. 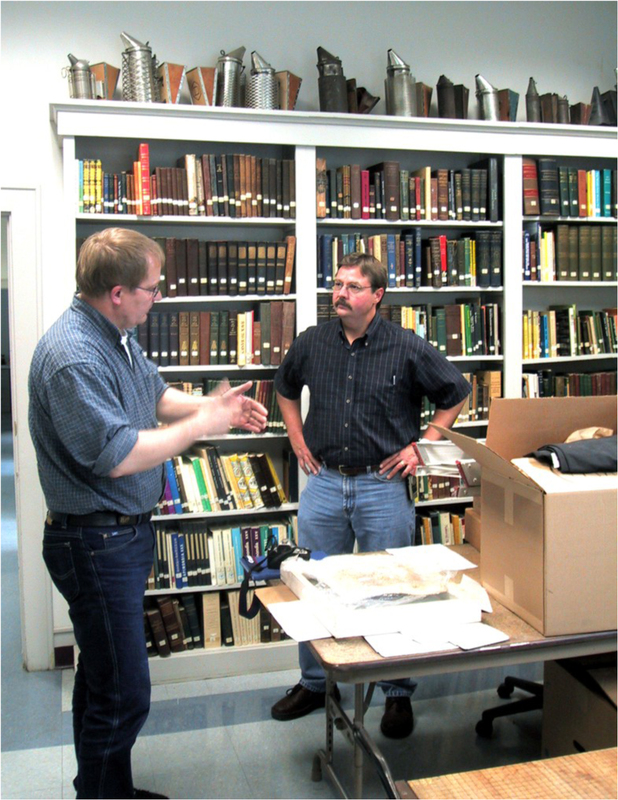 The scientists have collected data during a natural condition, well, a natural beekeepers condition of today. But they didn’t treat for varroa the 18 months before the data collection to have an enough big varroa population to get reliable data. I think the paper is interesting enough for anyone interested to buy the full text. 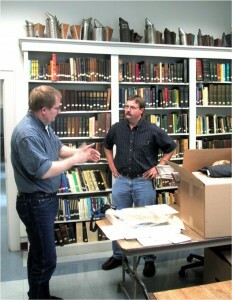 It contains a good discussion, which reveals a lot of knowledge on the subject. The test confirms other tests showing that Varroa mites prefer bigger cells. 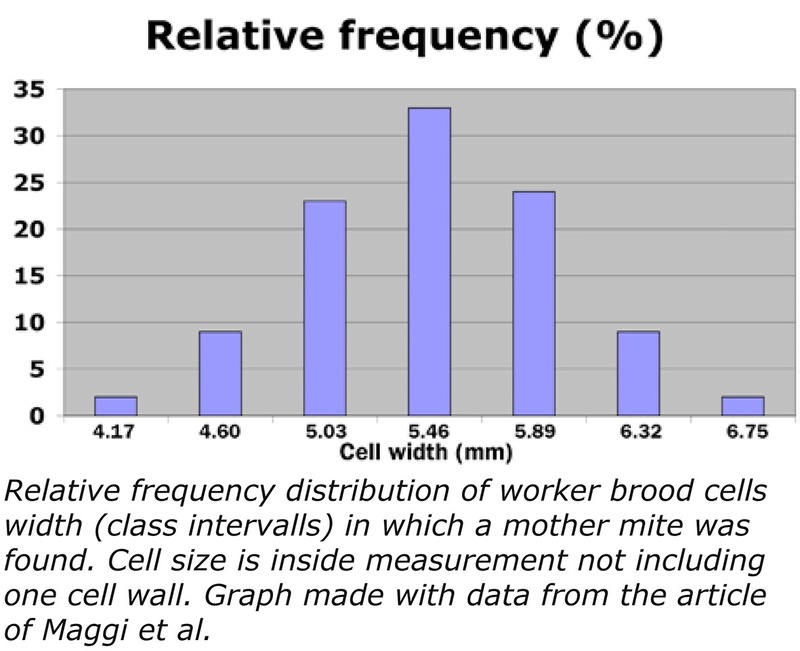 This test also shows that the distribution of mites in the brood with different sizes of cells is in line with that preference, the smaller the cell size the less probability that the cell is infested with a mite. But what then if there are only small cells in a brood nest – would the Varroa population grow at the same rate as if there were only large cells. That’s the really interesting question to get an answer to. That’s not what this test tried to get an answer to. But there is an interesting discussion in it. They took a capped brood frame from a number of colonies, uncapped all brood and registered and measured all cells with mites. When a colony in this test had a comb with different cell sizes the reason was that it was such an old comb that the bees had reworked the comb with patches of smaller cell sizes. Also old combs had smaller cell sizes due to a lot of cocoon residues. Some of the brood combs tested came from combs relatively newly drawn from foundation with 5.4 mm cell size imprint (personal information). The colonies had a mite infestation between 16 and 63 % in the worker brood. So the group of colonies did not form a resistant stock. 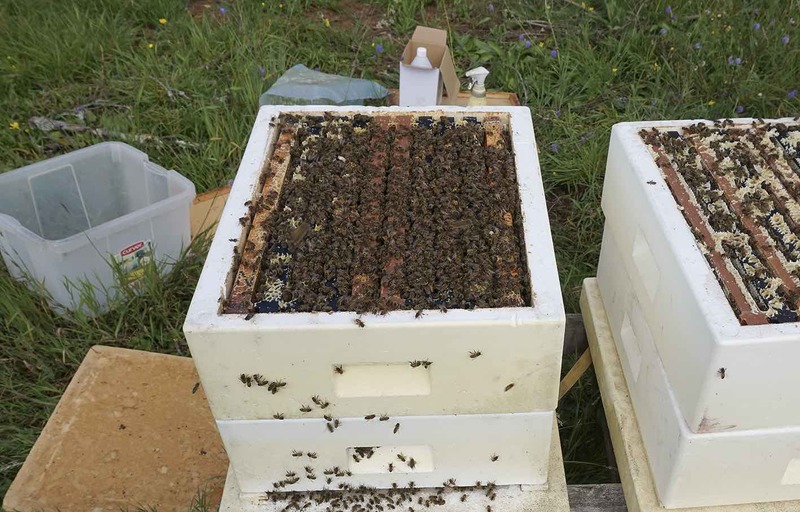 The more resistant colonies (with lower infestation) would have big problems with reinfestation from more susceptible ones if all were left untreated in the same apiary. Why do mites avoid smaller cells? There is a discussion why this is so. A probable answer is the food for the mites. They feed on larvae and pupae and bees. Larvae in smaller cells get different food, the phenotype becomes different. This is a logical explanation why mites are more attracted to larvae in bigger cells. The food is tasting better there and is more nourishing for the mites giving them a longer and more fertile life. In a lecture in Versaille in France 2006 on the SICAMM conference, the association for breeding the dark honeybee Mellifera mellifera, Yves Le Conte showed the graph on the picture here, taken by a Swiss beekeeper attending. The graph shows results from tests LeConte had done (most probably involving the varroa resistant feral stock he is working with), showing a decrease in fertility for mites in cells with smaller volume. This is almost the same as saying cells with smaller cell size. 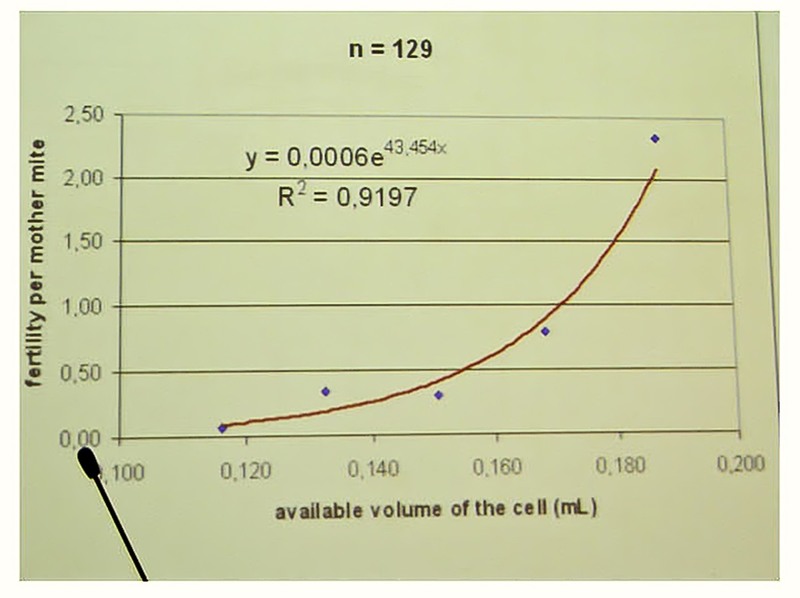 It’s just adding the depth of the cell to the bottom area (“cell size”, mm between the parallel sides of the cell, is a way of presenting the bottom area of the cell). Maybe this also indicates that the distance between the combs might influence if it’s narrow enough to give shorter cells. If the distance between the combs are bigger than necessary the depth of the cell will though not be bigger. The space to the other comb will though be bigger if on that side there is brood as well. The results of Le Conte and Maggi et. al. are confirming each other. Mites don’t lay eggs forever. After a number of rounds in capped brood cells laying eggs (about three normally) their fertility is over. Next time they enter a brood cell they are infertile, lay no eggs. Fewer rounds in smaller cells you might well don’t see in a short test, all those tests from two and a half month to a year that have been done. Especially if large cell control colonies are close by sharing their mites, more the higher the mite population grow. In an area with only small colonies then, why did the mites develop at all so heavily, in the beginning few years (with no or relatively little treatment)? Good question. Evidently some kind of adaption to the presence of mites had to take place. It seems the bees had to learn how to chase the mites. They developed better hygienic type of behavior against the mite, both a general reaction against mite infested brood and a more specialized like VSH (where only mites with offspring are cleaned out of brood). On top of that genetic selection that favor these behaviours. When queens from resistant feral bees from France were tested in Canada against “native” stock the result showed no difference. The queens were introduced in bee colonies that hadn’t learned how to deal with the mite because the mite pressure was in general to low, the bees were on large cells, the control colonies were to close to the test colonies sharing mites and the test period was too short. 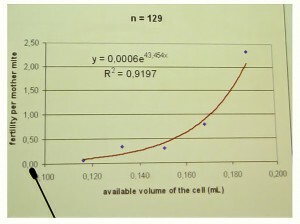 Could some of the VSH-result obtained in small cell bees be caused of or explained by the small cells? Are the small cells helping the bees and the beekeeper finding the VSH trait in the selection process? Will good VSH queens on small cells not give so good VSH bees on large cells? Or to put this another way. Do small cells contribute in expressing the VSH trait through making the mites infertile quicker? The results of Yves Le Conte and Maggie et.al. indicate that. Are the more phenotypic changes from small cells that have impact on resistance against varroa and viruses? You remember the previous post about the “multiple test”(MT)-colony, natural positioning, plastic frames, a mouse (or mice), mild winter and what a good condition this colony came out with now in spring. I’ve been thinking about it. Yes the mild winter has contributed to the good condition. But what about varroa and viruses? Mild winter doesn’t help if you have too much of both in a colony. I would say maybe the contrary, or at least questionable. A lot of varroa triggers extensive brooding, to kind of replace the affected sick brood resulting in a bad rat race. In fact one of the colonies in the apiary died during winter due to what looked like virus problems, in spite of some more treatment than the good colony got. And another colony which hadn’t received any treatment last year because it didn’t need it, it seemed, no DWV-bees, strong and healthy look – came out with fist size cluster and asking for survival until fresh pollen and steady temp around 60F (15C). We’ll see. And this good colony got less Varroa treatment 2013 compared to 2012, actually half – at the most only a tenth compared to non-selected bees for Varroa resistance. With the same queen 2012 and 2013. Now I think in spite of the dead colony and the one with the fistsize cluster, the average Varroa pressure, total amount of mites in the apiary, was less in 2013 compared to 2012. In fact I think this is the case in all my apiaries. Because I used in average about half the amount of thymol I used in 2012. This good colony I’m talking about specifically now got the average amount, 5 grams. Also, only 50% of the colonies going into winter had been treated during 2013, compared to 80% 2012. And, this spring winter die off will be less than 5% compared to more than 15% last spring. The Varroa pressure I think is lower due to better Varroa resistance in average in my stock, also in this apiary. The least good ones are showing up every spring, either they die in spite of treatment, or they show up weak and get treatment and later their queens are shifted. Also, from other beekeepers experiences, after about 5 years, mite pressure becomes weaker without any obvious reason. Probably some kind of epigenetic adaption (genes turned on and others turned off) is taking place that takes about 5 years from the first time the mites created problems. This spring is the fifth since the mites gave big problems the first time in all my apiaries. This adaption to the presence of the mite and fighting it probably also involves social learning. Bees learning to handle the mite and pass this knowledge on to other bees in the hive (http://www.hindawi.com/journals/psyche/2013/768108/). Therefore it’s important not only to propagate good resistant bee colonies by making new queens from it, but also by making new bee colonies from it, including worker bees that can pass their knowledge to new generations of bees. From the dead colonies through these diffcult years with Varroa I have harvested quite some badly drawn small cellsize combs. With too many patches of drone comb, and too many patches of bigger sometimes irregular “worker” cells. Good they have been culled. These plastic frames with plastic foundation with cellsize about 4.95 from Mann Lake (http://www.elgon.es/diary/?p=119) that was used in the bigger part of the third (the uppermost) broodbox in the MT-colony at least didn’t have a big negative impact on the colony health. Plastic haters might draw such a conclusion right away. Now, I’m not a plastic lover. I don’t like using plastic. That’s because in general it isn’t degradable in nature. That’s what I want, degradable plastic. But here it is in our world and I tried it. These plastic frames might even have contributed to the good health of the MT-colony. 10% more cells per comb, still quicker build up. No drone patches (BUT there should be drone patches here and there in the brood area to catch the mites that are there), no patches of bigger and irregular “worker” cells. No wavy combs (I use no wiring in my wax combs). 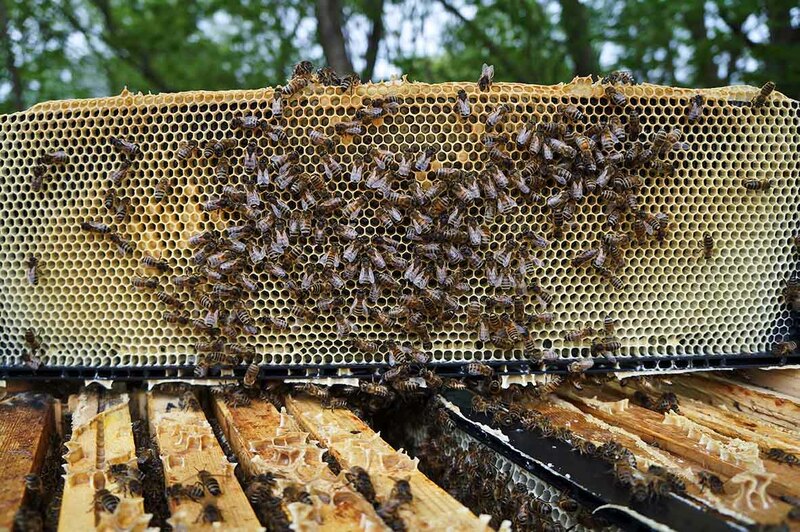 No big bridges of hindrance of wood for the queen between brood boxes. So I plan to try some more plastic frames from Mann Lake in brood boxes. But there should be a good balance between plastic and wooden frames as long as I will be using the plastic.